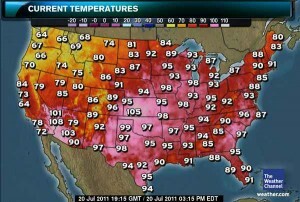 A massive heat wave is drifting across the United States, extending all of the way from Texas to the Canadian border. So far in July, nearly 1,000 daily high temperature records were tied or broken in cities across the nation, including 12 all-time highest temperature records. What does this mean for all of us? Yes, it’s time to crank up the air conditioner and hit the swimming pool. But more importantly, it means we need to be on the look-out for heat-related illnesses. Keith Tidball is a senior extension associate in the Department of Natural Resources at Cornell and the coordinator for the New York State Extension Disaster Education Network. These days, it’s his job to educate people about how to stay safe in the heat. But he also learned a heck of a lot on the topic as an infantry officer in the U.S. Army. “I saw my share of strapping young guys become injured – sometimes permanently – from heat-related illness,” he said. Heat illnesses can quickly become life-threatening. 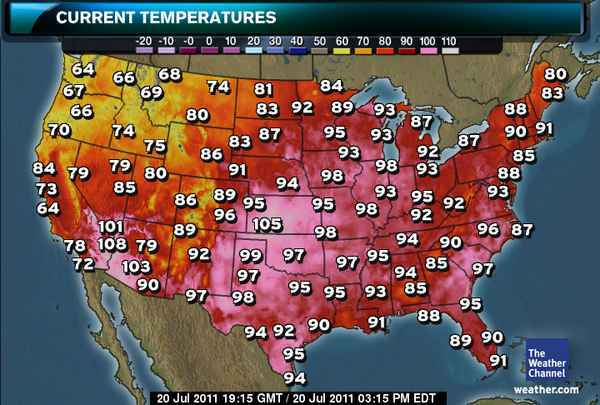 In fact, according to the National Weather Service, heat is the number-one weather-related killer in the United States. Your body is 50 to 70 percent water, and heat causes that water to evaporate. So staying hydrated is the most important thing you can do for your body during heat waves. Water is best, but anything without alcohol or caffeine helps. The best way to know if you’re hydrated is to check the color of your urine. If it’s clear or light-colored, you’re in good shape. If it’s bright or dark yellow, you need to drink a lot more water. Prevention is key. Once you’ve had a heat-related injury, you’re more susceptible to the next one. “In the military, you would have to wear a red tape around your uniform to indicate you’d had a heat-related illness in the past,” Keith explained. He also offered a host of resources from universities and federal agencies about ways to cope with the heat. The State of New York offers a fact sheet explaining how to identify heat-related illnesses and what to do in case of an emergency. The University of Florida offer tips for older adults to stay cool. Texas Cooperative Extension offers tips for people who work outside in the heat. Kansas State University provides info on helping dogs and other pets beat the heat. The bottom line: If you’re urine is not clear when it’s hot out, you’re in danger. So, go ahead, take a break right now and drink some water. I Hope The Temp In DC Breaks All Records! The link for working outdoors isn’t working for me. Do you mind checking it?